Aliases: "Last of the War Barons," "Last of the Samurai"
Powers/Abilities: The Dragon-Lord possessed superhuman senses which compensated for his total blindness. He wore sunglasses at all times to protect his eyes. He also wielded a World War II-vintage samurai sword, and had access to a vast stockpile of hydrogen-based weaponry. History: (Sub-Mariner#53 (fb)) - The man who would become the Dragon-Lord was an apprentice to Japanese scientists in a hydrogen complex researching atomic weaponry for Imperial Japan. After the Japanese surrendered, the apprentice was accientally shut inside of the facility, and forgotten. The apprentice kept himself alive in the dark, feeding on the base's rations. His eyes adjusted to the dark, and he began to study the technical manuals left behind. Soon, he began to renovate the machinery as he understood its purposes. He constantly searched for a way to escape the base, and finally discovered an air shaft that led to the surface. After years in the dark, the sudden light of the sun struck him blind. Local natives rushed him to a doctor for treatment, but he was blinded for life. 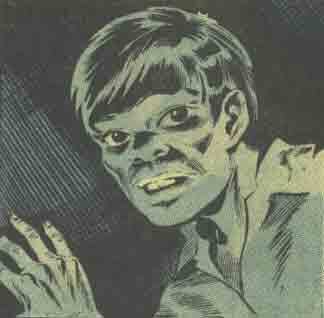 However, the man discovered he had a mutant ability which somehow compensated for his lack of sight. The man lived among the locals, and became respected for his intelligence. Eventually he became their high priest, and sent his subjects out to bring him materials to outfit an underground complex overtop of the hydrogen complex. He intended to use his resources to conquer the Earth, but needed a powerful ally to meet his goals; he found his ally at Tokyo in the mutant hero Sunfire. (Sub-Mariner#52) - Sunfire demonstrated his abilities to the Dragon-Lord, and Dragon-Lord was pleased. 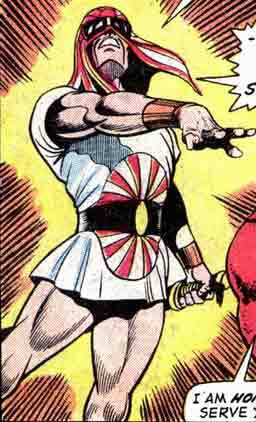 He claimed that Sunfire would help him conquer land for Japan's glory, but secretly sought his own victory. When one of Dragon-Lord's slaves escaped, he encountered Betty Dean-Prentiss, Namor the Sub-Mariner and Namorita. Sunfire retrieved the slave and returned him to Dragon-Lord, but the Sub-Mariner followed him. As the slave was sent for discipline, Dragon-Lord ordered Sunfire to attack a US Navy ship which was carrying defoliants to Vietnam. Although Namor tried to stop Sunfire, the ship's hull was breached. (Sub-Mariner#53) - Namor made Sunfire realize that the defoliating agents released from the ship he had blasted could cause a mass starvation, and worked quickly to repair the damage he had done. The Dragon-Lord and his men observed this, and when Namor and Sunfire began to tunnel into the complex, he planned to set off mines he had planted in the nearby US Marine base. (Sub-Mariner#54) - Sunfire blasted Dragon-Lord's hand when he reached for the button, and Namor doused him with water to squelch his devices. As Dragon-Lord's base began to fill with sea water, Sunfire carried Dragon-Lord with him, but Dragon-Lord drew a samurai sword on Sunfire, only to have Sunfire melt the blade. Namor grabbed Dragon-Lord and flew them to safety. When the Dragon-Lord boasted that his ultimate weapon would remain behind for someone else to use, Sunfire responded by blasting his base, destroying it. Namor and Sunfire dropped Dragon-Lord off at the US Marine base. Comments: Created by Bill Everett and Mike Friedrich. To explain Dragon-Lord's survival from the end of World War II to contemporary times, I would suggest that the hydrogen complex included some experiments into life prolongation by the Japanese, and that he was able to master it. Dragon-Lord could be the scientist's apprentice of Professor Rudo (Captain America Comics#51; December, 1945; Captain America 1st story) the creator of Atom Water (which detonates upon evaporation from the sun's rays) and the island Dragon-Lord was trapped on could be the same island as seen in the Captain America story. He would presumably have lost his superhuman senses on "M-Day," leaving him truly blind. He received a real name in Sunfire's entry in OHOTMU A-Z HC#11.